Mary Shelley is well known for her novel Frankenstein, or the Modern Prometheus, which she wrote in her late teens while in Switzerland with the likes of Byron and of course the renegade poet Percy Shelley. But she was the product of a couple who were regarded as radicals: Mary Wollstonecraft, the early ‘feminist’ who wrote A Vindication of the Rights of Woman and William Godwin, a radical political philosopher. Though Godwin and Wollstonecraft were certainly not traditionalists, but they married a few months before the birth of their daughter. Ten days after Mary’s birth, her mother died, and this death had a profound effect on her. Growing up, Mary was surrounded by books and exposed to literary discussions among the likes of Wordsworth, Coleridge, and Hazlitt. Little wonder, she began writing at an early age. Mary’s life took a downward turn, however, when her father married for the second time as her stepmother supposedly favored her own children. The discord proved too much for Godwin who sent his daughter to board with friends. Upon returning home at age fifteen, she first met Percy Bysshe Shelley, who was expelled from Oxford for writing a tract about atheism. In 1814, Shelley encountered Mary again, and though he was married, he became infatuated with Mary. They apparently spent time at her mother’s grave and became intimate. When Godwin found out, he tried to forbid the relationship. But after Shelley threatened to commit suicide, Mary ran away with him to France. But this was not the love match that we all love to read in modern romance novels. Many associate the 1960’s as the decade of free love, but Shelley certainly ascribed to it and took other lovers. He also encouraged Mary to enter a liaison with his friend Hogg, but she was pregnant and refused. She endured money troubles and the loss of five children. After Shelley drowned in a boating accident, Mary published several other articles and books, but her Frankenstein has endured the test of time. She died in February 1851. Vicky Dreiling is a confirmed historical romance junkie and Anglophile. Frequent business trips to the UK allowed her to indulge her passion for all things Regency England. Bath, Stonehenge, and Spencer House are among her favorite places. She is, however, truly sorry for accidentally setting off a security alarm in Windsor Castle. That unfortunate incident led her British colleagues to nickname her “Trouble.” A native Texan, she holds degrees in English literature and marketing. She is a triple finalist in the RWA RITA awards, and her debut novel How to Marry a Duke won the HOLT medallion for best historical romance. Her most recent novel How to Ravish a Rake was published April 1! We are so often given small glimpses of lives as we research the Regency, or any other era. I've frequently wished that some person I discover had kept a diary, or someone had published a volume of her letters, or she had been famous enough to be noticed in a substantial way. Amelia Curran is one such person. She knew, very well, many of the main players on the Regency stage, and we can only wonder what she thought of them. Amelia was born in 1775 in Dublin to Irish MP and barrister John Philpot Curran and his wife Sarah. She grew up in an atmosphere of culture, literature, and politics. She presumably enjoyed her meetings with the political notables of the era such as William Godwin and Aaron Burr, and may have acted as her father's hostess after her parents' divorce in 1795. Variously described as witty and kind, mild and gentle, she nevertheless did not marry, but pursued an artistic bent. In 1810, she met Percy Bysshe Shelley, who had come to Ireland in pursuit of justice against what he considered tyranny, and to further, informally, his radical education. Amelia was thirty-five, Shelley was eighteen. 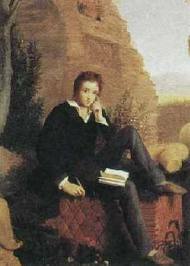 Despite the difference in their ages, they developed a friendship that was to last throughout Shelley's brief life. When in 1812 Shelley travelled Ireland campaigning against British injustice, Amelia was with him. Their paths crossed again and again with Shelley's peripatetic search for meaning and truth. One can only speculate on Amelia's character. Harriet, Shelley's first wife, described her as a 'coquette'. Was this an unkindness by a jealous wife? Others said Amelia was 'amiable' and 'agreeable'. These are slim encomiums, and we have no idea what Amelia looked like. Certainly there was a strength of character in her that many Regency ladies did not possess or, at least, did not display. For Amelia Curran travelled to Italy, determined to further her artistic career. She studied art, and made, apparently, a slim living copying Old Masters and painting portraits. There was a large ex-patriate British community in Italy, among them Irish radicals such as George Tighe, John Taafe and Lady Mount Cashell. No doubt some of her commissions came from people from 'home'. In 1818, she met the Shelleys in Rome. How accidental was this meeting? Had she travelled to Italy knowing that the Shelleys were expected there? Percy had by this time moved on to his second wife, Mary, who became a good friend of Amelia's. There seems to have been none of the jealousy that first wife Harriet experienced. Firmly attaching herself to the Shelleys' menage, Amelia was introduced to Byron, Leigh Hunt, and Claire Claremont. Amelia was, in my opinion, an indifferent artist. The Atheneum magazine remarked on her 'childish incompetence'. 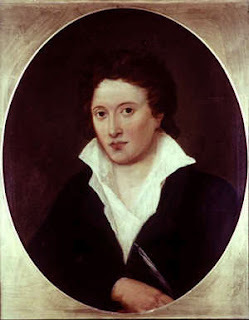 Nevertheless, she was the only artist to paint Percy Bysshe Shelley in adulthood. That alone was enough to guarantee her a certain degree of celebrity. Amelia began her portrait of Shelley almost immediately upon their meeting in Rome. She herself considered it 'ill-done'; it has been suggested that it resembles one of Shelley's favourite paintings, by Guido Reni. Amelia was one of the few artists to capture an image of Claire Claremont. Claire detested the portrait for which she sat in May 1818, but it was sent hang in England at Newstead Abbey. 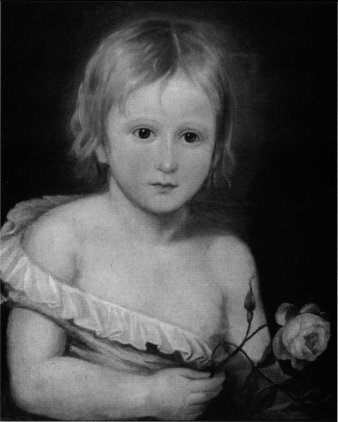 Amelia also painted the only portrait of Shelley's son, William. It is the most successful picture of the three portraits. Unfortunately, the child died shortly thereafter at age three. The Shelleys were devastated and the portrait was treasured. When Percy Bysshe Shelley died in a boating accident in 1822 at age twenty-nine, everything changed for Amelia Curran. She moved to Naples, then on to Paris, eventually returning to Rome in 1824. 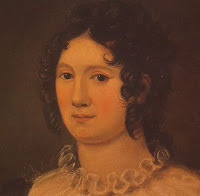 Richard Robert Madden who knew her during her post-Shelley years described her as being "in bad health...[suffering] fits of melancholy", some of which lasted weeks. Was this a depressive illness which she had suffered all her life? Or was it something engendered by her loss of Shelley, who had been special to her? "She was the most witty and agreeable woman I ever knew, full of talent and kindness; a musician, a painter, and a writer. I loved and respected her sincerely." 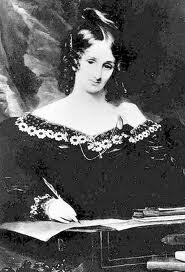 Next week, guest blogger Vicky Dreiling will be here talking about Mary Shelley. 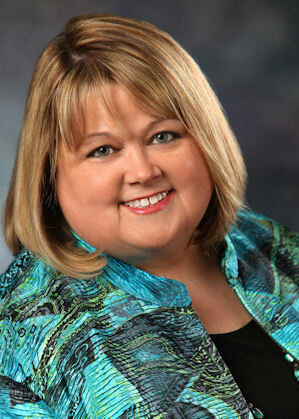 Vicky is the author of three Regency romances, and is a confirmed historical romance junkie and Anglophile. Frequent business trips to the UK allowed her to indulge her passion for all things Regency England. Bath, Stonehenge, and Spencer House are among her favorite places. She is, however, truly sorry for accidentally setting off a security alarm in Windsor Castle. That unfortunate incident led her British colleagues to nickname her “Trouble.” When she’s not writing, Vicky enjoys reading, films, concerts, and most of all, long lunches with friends. A native Texan, she holds degrees in English literature and marketing. Feathers, from time immemorial, have been a part of humankind's culture. For centuries, birds have given up their plumage in the name of ritual, ceremony, and symbol. But, particularly in the last three centuries, feathers have been a statement of fashion. In the 1700's, a thriving trade, or profession, grew up--that of plumassier--one who prepared , traded and merchandised feathers. Plumassiers of the 19th century may not have prepared their own feathers. Preparation was a lengthy process involving degreasing by washing, dyeing and tinting, trimming, crimping and styling. It was a recognized trade, involving extensive training. The plumassiers whose names have come down to us were retailers, W. T. Botobol of the Regency era, and Madame Carbery mentioned in period documents of 1825. I have been able to discover no other information about these two dealers in feathers, so we cannot know their involvement in the preparation of their products. In any event, the retailers of feathers had to be au courant with every aspect of the fashion industry. 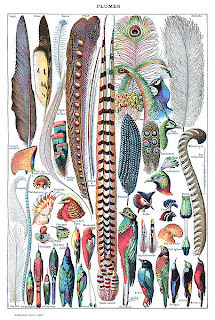 Fashions in feathers were as variable as fashions in jewels, fabrics and colours. 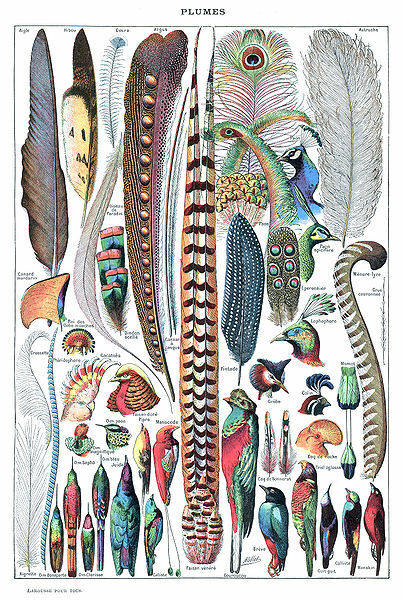 In 1800 the following feathers were noted as the most in favour: bird of paradise, argus pheasant, Indian macau, and cocque. The argilla, the esprit plume, and the Seringapatam plume are mentioned as well. 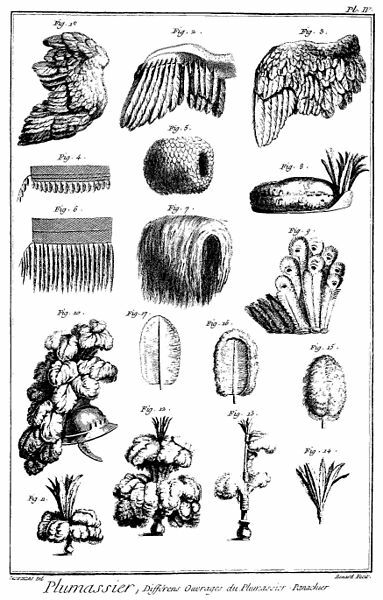 Whether on ladies' hats and aigrettes, in plumes for the military, in marabout trims, or swansdown muffs, feathers were ubiquitous and plumassiers a well-known part of the commercial scene. The ostrich feathers, flat and porcupine, required by the Prince of Wales' feathers were the most popular by far of the myriad feathers in use. They were obtained from South Africa, and the near and middle East, where they were hunted to extinction. 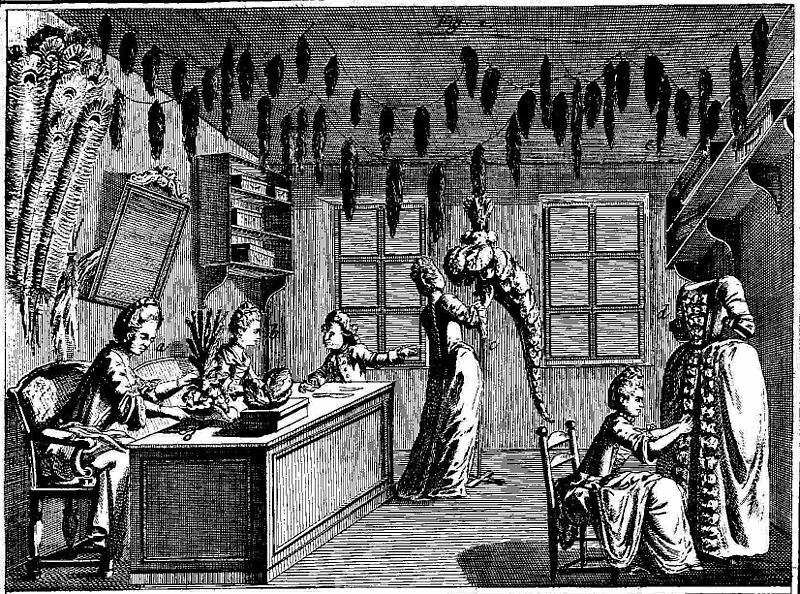 The gathering of feathers for fashion was a disastrous occurence for bird populations around the world. In the U.S.A. the Carolina parakeet was hunted to extinction, and the egret nearly so. The end of the nineteenth saw the height of the destruction, and it also brought the first regulations and restrictions on the industry. Nevertheless, the scarlet ibis is currently endangered by the trade. If you find the dark side of the industry interesting this blog is full of facts and statistics--Fashioning Feathers. The New York Times in 1998 designated Andre Lemarie the 'last of the plumassier breed'. His Lemarie House in Paris, founded in 1880 and famed for its outstanding products, was bought by Chanel in 1996. Nevertheless, the occupation of plumassier still exists, taught in French vocational colleges, and elsewhere. Feathers still adorn ladies' hats and the new 'fascinators'. Plumes, boas, wings and tufts of feathers still charm us, and awe us with their beauty. The plumassier's was one shop every Regency lady loved to visit, and most of us would eagerly join her there. Don't you just love a book sale? I've been to a book sale! Our symphony society does a fund-raising book sale each April, and it is a treasure trove of the unusual and often unattainable. And the prices! All the books below were $1.00, $1.50 and $2.00. Except for Moule's County Maps: The West of England, which was $4.00. Which is still a fair price, considering this is a 9" x 12" hardcover with 48 pages and 19 full colour maps of the Britiain of 1836. 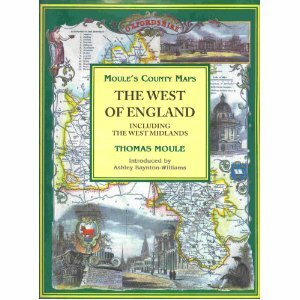 I already owned the complete County Maps of Old England, also by Moule, but The West of England version has two more town maps--Southampton and Exeter. For $4.00, how could I go wrong? Then there was English Antiques: The Age of Elegance 1700-1830 by Donald Wintersgill. It is a 1975 publication, but right on target, datewise, and this kind of information never goes out of style. French artist of the Revolution, Madame Vigee Lebrun has always been a favourite of mine, and when I spotted her Memoirs, translated in 1903 by Lionel Strachey, I snapped it up. I got lucky also with books on English architecture. 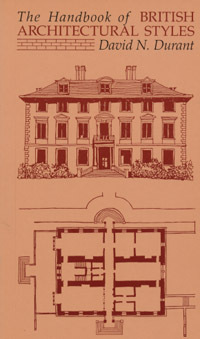 The Handbook of British Architectural Styles by David N. Durant is a nice compact little volume with delightful pen and ink drawings and a wealth of invaluable detail. And for every style it discusses it includes "Where to see examples"--very helpful for travelers. A nice little Country Life book on Victorian Churches by Peter Howell caught my eye. It is part of their RIBA drawings series and is a good addition to my other books on English churches. An obscure volume titled Local Style in English Architecture published in 1947 rounded out the architectural books. It is subtitled "An Enquiry into its origin and development" and has a serious, scholarly bent, but it's also stuffed with period photos, maps and drawings. I was lucky enough to find two facsimile editions of interesting books, originally published almost exactly one hundred years apart. Flora's Lexicon: The Language of Flowers by Catharine H. Waterman was originally published in 1860. It includes some unusual plants, and some poetry by long-forgotten poets. The Compleat Housewife by Eliza Smith was first published in 1758 and makes fascinating reading. There is a Publisher's Note on the Contents page that made me smile: "Remedies and Cures included should not be used as they could be dangerous and a threat to health." No doubt they will find their way into my blog, or my tweets! My prize for the day was published in its second edition in 1911. The first edition was 1898. Entitled Wit, Character, Folklore and Customs of the North Riding of Yorkshire by Richard Blakeborough, it was published by W. Rapp & Sons Limited of Saltburn-by-the-Sea. The title page proudly stated that it includes 'A GLOSSARY of over 4,000 Words & Idioms NOW IN USE'. This book appears to have been reprinted several times in the past hundred years, but my version is the original red cloth hard binding with the author and title picked out in gold on spine and cover. It cost me $15.00, but it's in wonderful condition, and I adore really old books. I am working on listing all my research books (and a few other titles) on Goodreads these days--in the hope that they may be of interest to other Regency aficionados and researchers. You can visit my Goodreads here--I would be delighted to be friends with you. My 'bookshelves' are in the left hand column, and they are filling up as I have time to add titles.